13/4/13 - Art market - Paris - An ensemble of drawings by François Chauveau which resurfaced and are preparatory for engravings, a rather common subject given the impressive number of prints (and drawings) produced by this 17th century artist, a student of Laurent de La Hyre, are currently on display in Paris. In the preface of the small catalogue for the exhibition organized at the Arsinopia Gallery, Maxime Préaud reminds us that he is probably the author of about 5,000 projects, both originals and interpretations after his contemporaries. However, there are very few preserved drawings and the offerings appearing on the market are rare. Moreover, there has never been an exhibition on the artist thus making a visit rue de Seine a must for any art lover of the French 17th century. The sheets come from a forty-page collection containing 67 drawings and two engravings by Chauveau, plus nine drawings by Baptiste Pellerin. Separating an ensemble is always unfortunate but in this case, it was an artificial assembly of works lacking any coherence. 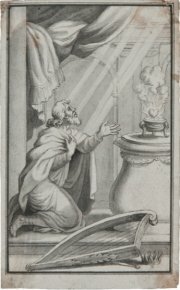 Some preparatory studies for the same engraved series were separated by others which were unrelated, apparently indicating that the album was not put together by the artist but no doubt after he died in order to sell the pieces as one lot. In any case, the series have been reassembled here and are being sold together. The size of the drawings is generally small, allowing some to be placed within the same frame. The number of engravings produced by Chauveau made the subjects hard to identify but the task was nevertheless successful. 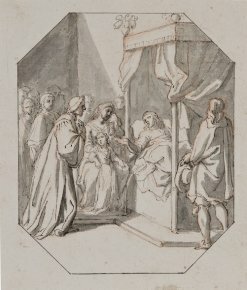 Thus, there are projects for illustrations of Les Fables de La Fontaine (ill. 1 and 2) ; a complete series of the Parnassus and the Nine Muses (ill. 3 and 4) preparatory for Thesaurus Numismatum E Musaeo Caroli Patini Doctoris medici by Charles Patin ; two studies produced for L’Oraison Funèbre de Messire Pierre Séguier (ill. 5), a collaboration by many members of the Academy, as well as illustrations for the works of Racine (ill. 6). Most of these sheets (all original designs by Chauveau) are done in pen, brown ink and brown wash. The engraving works were joined by nine small pen drawings by Baptiste Pellerin, representing allegories of human virtues. Pellerin was recently rediscovered by art historians : a native of Orleans, active in Paris between 1549 and 1575, he was a miniaturist, painter and decorator, who worked notably for Henri II and Catherine de Medici. The nine drawings were engraved by Etienne Delaune. The exhibition is organized by the Arsinopia Gallery on the premises of the Galerie L’Atelier des Artistes, 74 rue de Seine, 75006 Paris, until 24 April (open from Tuesday to Saturday, from 10 am to 12:30 and from 2 pm to 7 pm). A catalogue by Jean-Louis Litron has also been published for the occasion.